Back in the ‘40s, flicks cost a whole lot less to make and a whole lot less to see—eleven cents got us in, five cents for popcorn. We got our money’s worth. Every Saturday afternoon across America kids were set loose in the noisy dark for hours and hours—two features (an ‘A’ and a ‘B’), newsreel, cartoon, coming attractions (some more exciting than the flicks), slew o’short subjects, serial, maybe even prizes and vaudeville. No telling what wonders lay in wait beyond the uniformed ticket takers. What do kids do today of a Saturday afternoon? Oft’ times I’d venture forth to Hollywood Blvd. on the Asbury Rapid Transit bus. My mom didn’t worry. ‘Twas safe back then. It pleasured me to stand in the footprints of the movie stars on the forecourt of Grauman’s Chinese Theatre. My feet were bigger than Joe E. Brown’s! But what happened to Rod LaRoque? Wasn’t he here last week? Reckon some of the old silent screen luminaries were disappeared to make room for the happenin’ generation. How? Did men in black come in the night to dig up the hand and footprints of former screen idols and consign them to the depths of Grauman’s Chinese basement? Is there a tomb down there stacked with autographed cement slabs, an underground cemetery of shadows, echoes and fallen stars, Hollywood’s answer to the lost elephants graveyard? If so, RIP. And where did all the dead street cars go? Long ago the trolley tracks were ripped up. The boulevard of broken dreams was eviscerated. When the street cars vanished, so did a lot of the heart and soul of the City of Angels. In my childhood, a buck and a quarter weekly pass entitled you to unlimited streetcar rides all over town. I gleefully rode the red car up and down Hollywood Blvd. on those enchanted Saturdays. I’d sit on the right side by an open window and pull out my packet of beans and my trusty bean shooter and look for my mark, an easy loper. I’d perfected the fine art of phantom bean shooting—I’d blow a steady stream of beans out the window onto the overhanging shop awning, timing my onslaught so that when my mark reached the shop, the beans had begun their decent off the awning and were now cascading onto said loper’s head. He’d look up with a start—He’d see nothing—He’d let out a cherse curse—Then he’d move on. The streetcar was slow. Stopped for passengers at every corner, and the traffic was heavy, it took a while to catch up with my victim, and when we did I let him have it again with a fresh salvo of ammo. I can imagine my mark’s state-of-mind: “What unseen specter is this hovering over me, following me, unloading an endless fuselage of beans onto my unprotected head? Why me?” This jolly prank continued till we reached Hollywood and Vine, where I alit and paid my weekly visit to Bert Wheeler’s House of Magic. Bert was pretty good. He was a master of the disappearing weekly allowance trick. I saved up and bought the color-changing knife trick. For the uninitiated to open the blade was a puzzlement. You didn’t pull it, you pushed it. One night a fellow slight o’hander and I attended Orson Welles’ Magic Show performed in a huge tent on Cahuenga Blvd. in Hollywood. How thrilling to see Orson saw Rita Hayworth in half. For one grand illusion Orson passed among us in the audience asking for the loan of a knife. I offered him my new color presto-chango. He barked, “This is a trick knife! I can’t open it!” And he stormed off. Good thing. He no doubt wanted to slit my throat. 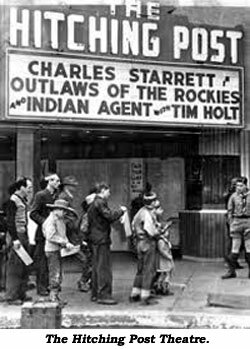 Next door to Bert Wheeler’s shop was the Mecca of movie matinee maniacs, The Hitching Post Theatre, home of classic B-westerns. A good way to wrap up a perfect Saturday afternoon, providing you still had a fast eleven cents in your pocket. I heard tell hard-core gamblers frequented the place. They’d sit in the back row and make side-bets: After the bank robbery which posse member would take the longest to mount? What bad guy’s horse would gallop past the old oak tree first? What shirt would Roy wear in the next scene? 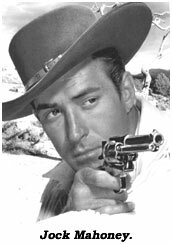 I loved ‘em all—Tex, Lash, Hoot, Gene, The Durango Kid. saloon balcony onto an awaiting horse. (How many times have you seen a stunt person perform that puppy wearing tennis shoes?) This stunt is fraught with peril. If the horse moves it can be very painful. Movie horses are smart. They know! Best not to over-rehearse. When they hear “Ready! Camera!! Action!” They tend to get skittish and screw up the shot—Ugh! Bad medicine for B-budgets. Jocko had a stroke of genius. He whispered to the director, then climbed to the balcony and made ready. The director silently signaled the camera operator to roll ‘em and then yelled, “That’s lunch!” The horse relaxed, and Jocko made his pawless leap. Whatta guy! 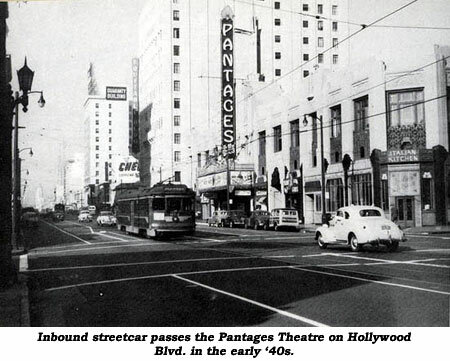 In the mid ‘50s, a fellow UCLA cinema student and I strolled down Hollywood Blvd. on an Easter Sunday. We sauntered into one of L.A.’s oldest and most successful eateries, Musso-Frank, for brunch. We sat at the counter. As we put down mighty-tasty-you-bet-flannel-cakes, our waiter, Sal, was in good spirits—we traded cheerful banter back and forth across the counter like a game of badminton with words. Came time to pay, and jovial Sal wouldn’t take our money. “Happy Easter, eggs!” he said. Maybe he thought we were bums. Maybe he was right. I’ll always remember that day. What a blue-chip gent was Sal. Such moments of random kindness in La La Land you could count on the pitching hand of famed baseball player Three Finger Mordecai Brown. If a time machine landed that could take me back to those glorious Hollywood Blvd. daze of yesteryear, the ‘30s and ‘40s, would I hop aboard? Heh, heh—in a hot New York minute. In a hot Hollywood heartbeat.